We have entered into an entirely new era, an age of increasingly frequent and intense periods of turbulence in the global economy. Unlike past recessions, today’s crises have precipitated a need for businesses to develop a new mindset, one that takes into account intermittent periods of disturbance, allowing them to thrive while under the constant threat of chaos. 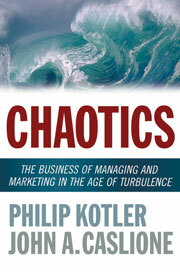 Chaotics presents a revolutionary set of guidelines designed to help businesses: • detect sources of turbulence • prepare scenarios • predict resulting vulnerabilities and opportunities • develop responses to ensure long-term resilience and success • avoid risk while advancing the interests of the company • build flexibility into the balance sheet • price strategically • adjust products to meet new customer values • and more Complete with metrics and measurements, Chaotics outlines a powerful new system for managing waves of uncertainty affecting customers, employees, and other stakeholders. In this climate of increased turbulence, no organization can survive with less.